Mercury (Hg), a neurotoxic airborne pollutant, can be transported long distances by wind and deposited in remote lakes and ponds, threatening fish and loon populations through methylation and bioaccumulation. In the last two decades, regulations to control anthropogenic Hg inputs have been implemented, reducing emissions from waste combustors and incinerators, coal-fired electric generating units, and industrial facilities across North America. Long-term monitoring of Hg in fish and loons can help indicate if biological recovery is occurring in freshwater systems, corresponding with the decline of anthropogenic mercury deposition documented in the northeastern USA. We assessed the spatial and temporal trends in fish and common loon Hg concentrations in New York’s 2.4 million ha Adirondack Park. We found Hg concentrations in yellow perch decreased from 1992 to 2016. Concentrations of Hg in loon increased from 1998 to 2010 and then stabilized from 2010 to 2016. We found a delayed recovery of Hg levels in common loons, despite the recent declines in atmospheric Hg. We used bootstrapping and calculated the minimum detectable changes with the required sampling intensity (number of lakes per year and number of years) for monitoring fish and loon Hg over time. We found different sampling intensity might be needed for different species of fish, different sexes and ages of loons, and lakes with different pH. The above papers are currently in preparation for a special issue in journal Ecotoxicology for Hg studies in New York. This project was support by the New York State Energy Research and Development Authority. Mercury (Hg) is a neurotoxic pollutant emitted by anthropogenic activities that can be transported long distances and deposited in remote forested areas. Soils are the largest pool of Hg on land. Pathways of Hg accumulation and loss in forest soils include throughfall, litterfall, soil gas fluxes, and leaching in soil solutions, all of which will likely be altered under changing climate. In the future, we expect more frequent extreme events such as ice storms and drought, warmer soils, and more frequent soil freeze-and-thaw cycles due to a reduced snowpack. We took advantage of three ongoing climate-change manipulation studies at the Hubbard Brook Experimental Forest, New Hampshire, USA: a combined summer-warming and winter-freezing experiment, throughfall exclusion to mimic drought, and a simulated ice storm experiment. Across these three studies, we compared Hg inputs in throughfall and leaf litterfall and Hg outputs in soil gas fluxes and soil solution. We found that our forest soils served as a net sink for Hg in our undisturbed plots and climate manipulation plots. However, climate changes such as warmer air temperatures and more intense ice storms exacerbated Hg pollution by releasing Hg sequestered in forest soils. We are currently writing a paper for publication. Mercury (Hg) in the environment has been receiving increased attention, but little is known about the Hg that accumulates in trees. The purpose of this project was to advance the understanding of Hg in forest biomass. We first determined the methods necessary to accurately quantify Hg in bole wood, using four North American tree species. We analyzed wood tissue samples by thermal decomposition, catalytic conversion, amalgamation and atomic absorption spectrophotometry, using a direct Hg analyzer. We determined the relationship between aliquot size and detection limits using dosing techniques. We evaluated the effect of air-drying and oven-drying samples on Hg recovery, compared to freeze-drying samples prior to analysis, which is the standard procedure. We found samples that were freeze-dried or oven-dried at 65°C were suitable for determination of Hg, whereas oven-drying at 103°C resulted in Hg losses, and air-drying resulted in Hg gains, presumably due to sorption from indoor air. 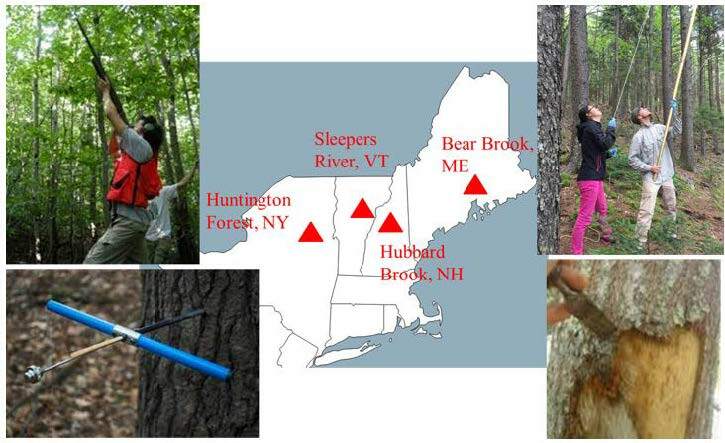 We then analyzed mercury concentrations in foliage, bark and bole wood of eight tree species at four sites in the northeastern USA (Huntington Forest, NY; Sleepers River, VT; Hubbard Brook, NH; Bear Brook, ME). We compared the importance of site and species in controlling tree Hg concentrations to indicate the relative importance of Hg exposure and the properties of tree species. We found sites differed significantly in Hg concentrations of foliage and bark, which are directly exposed to the atmosphere, but the concentration of Hg in wood depended more on species than site. We then compared Hg pools among tissue types and between conifer and hardwood stands. We found the Hg contents of tree tissues in hardwood stands were higher in bark (mean of 0.10 g ha-1) and wood (0.16 g ha-1) than in foliage (0.06 g ha-1). In conifer stands, because foliage is retained longer and has higher Hg concentrations, the foliar pool tended to be more important. We also evaluated the feasibility of using tree rings of various species to indicate past atmospheric concentrations and deposition of Hg in forests. We analyzed wood in 5-year increments going back 70-80 years for trees of 3 hardwood and 2 conifer species to distinguish between two alternate explanations for Hg accumulation in trees. Results for this paper are currently in preparation. This project was support by the Northeastern States Research Cooperative and SUNY-ESF Seed Grant. We combined existing data and new measurements to compute annual nutrient (nitrogen, phosphorus, sulfur, calcium, magnesium, and potassium) flux in net throughfall, litterfall, and aboveground biomass increment, as well as to account for the belowground biomass component in hardwood and coniferous forest types under contrasting conditions of soil calcium status in Sleepers River, VT; Hubbard Brook, NH; and Cone Pond, NH. The major new effort in this project was directed at measurements of root turnover. Neither aboveground biomass and production nor belowground biomass were related to soil calcium or calcium: aluminum ratios across the calcium gradient. Hardwood stands had 37% higher aboveground biomass and 44% higher leaf litter production than the conifer stands, on average. Fine root biomass (<2 mm in diameter) in the upper 35 cm of the soil, including the forest floor, was very similar in hardwoods and conifers (5.92 and 5.93 Mg ha−1). The turnover of fine roots increased significantly with soil exchangeable calcium. As a result, calculated fine root production was clearly higher in sites with higher soil calcium in both hardwood and conifer stands. The relationship we observed between soil Ca availability and root production suggests that cation depletion might lead to reduced carbon allocation to roots in these ecosystems. This project was funded by the Northeastern States Research Cooperative. Until now, there has not been a method for accurate and rapid evaluation of belowground carbon and nutrient stores, in spite of their ecological, environmental, and economic importance. 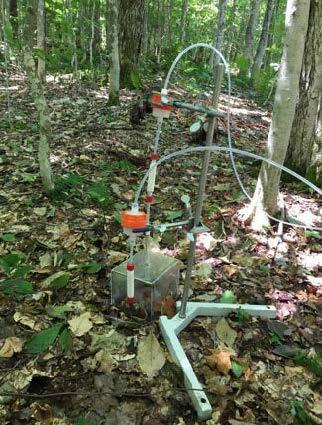 The variability of forest soils has made it difficult to test factors hypothesized to influence C storage in roots and soil organic matter in realistic field experiments. In particular, anthropogenic N deposition is expected to have a positive effect on belowground C storage, but this effect has not been detectable even in accelerated N deposition experiments. We propose to demonstrate and develop a transformative new technology for analysis of soil carbon and nutrients. This new technology uses inelastic neutron scattering (INS) to non-destructively quantify belowground stores of carbon and other elements, including coarse roots, which were previously difficult to sample, and around rocks, which were previously obstacles. Our objectives include the development and transfer of this technology for C and N in forest soils and also the advancement of ecosystem science pertaining to soil C and N storage. In the first year of the proposed project, we will validate the INS measurements with cores taken in the footprint of the INS in stands previously described with quantitative soil pits in the Bartlett Experimental Forest, NH. The capability of the INS to measure N and not just C will be tested for the first time. In the second year of the project, we will apply INS measurements to permanent plots in two long-term N addition studies. At Mount Ascutney, VT, N has been added to high-elevation spruce-fir forests at rates of 15 and 31 kg/ha/yr since 1988. At Bear Brook Watershed in Maine, 25 kg N/ha/yr has been added to one of a pair of watershed since 1989. The INS measurements will test the hypothesis of increased C storage and also provide a baseline for future sampling. Previous measurements using traditional destructive methods could not be made at the same point on the ground and were thus limited in their statistical power to detect change over time. Before the INS technology can be widely adopted, it requires demonstration and development. Applying the test of the INS approach in forested sites in stony soils will provide confidence that the system can be used in almost any environment. If successful, the INS technology will allow carbon sequestration projects to come closer to full carbon accounting, making it feasible to include belowground carbon in offset activities in cap and trade programs. This project is supported by the Northeastern States Research Cooperative, SUNY-ESF Seed Grant, and a Edna Sussman Baily Internship. Because the most valuable sugar maple trees are those with small hearts, foresters, loggers and landowners would benefit from a heart-size prediction model. 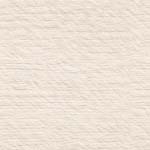 Few studies have examined the relationship between dark discoloration size and site or individual tree factors. The first part of this study was based on logs from 52 timber sales in 6 states. 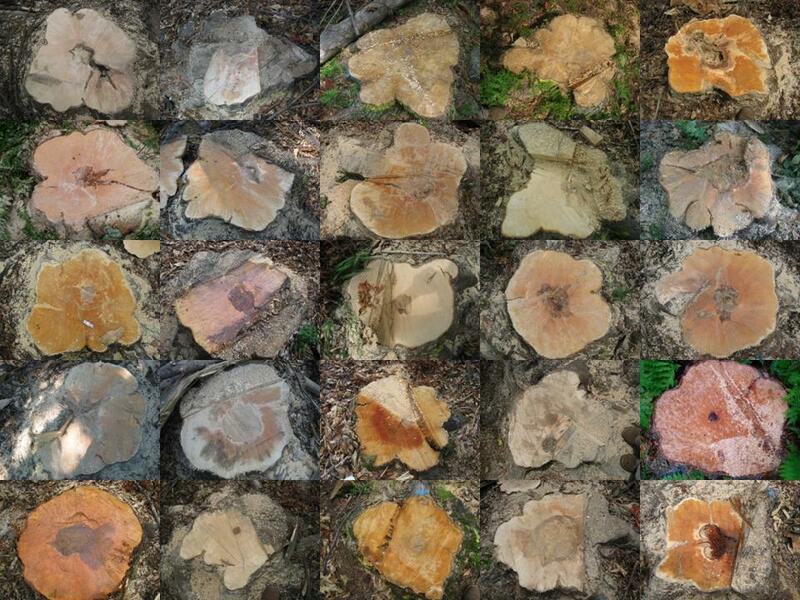 The second involved measurements of trees before harvest and compared tree and site characteristics to heart size measured on stumps post-harvest. This project is was funded through a grant awarded by the Wood Education and Resource Center, Northeastern Area State and Private Forestry, Forest Service, U.S. Department of Agriculture. In the northeastern US, we are in the fourth year of an outbreak of forest tent caterpillar. We are seeking funding to examine the factors that cause some stands to suffer dieback and mortality following defoliation, while other stands recover. This project involves monitoring forest health, analyzing geographic information, including aerial coverage of defoliation history, and working with state agencies and other stakeholders. This project is funded by the Northeastern States Research Cooperative. We collected and analyzed soil samples from a total of 24 sites in Maine, New Hampshire (all 14 located in the White Mountain National Forest), New York and Pennsylvania: The results of this work have been surprising. First, we found that apatite is indeed an important source of Ca in soils in rocks derived from granitoid parent materials, but it is less important in sedimentary rocks. One paper, published in the Journal of Forestry in 2005, describes this finding, and another is in preparation by Carmen Nezat, which treats the subject in more detail. The method for identifying apatite in soils is an important product of this research. Another manuscript has recently been submitted soon to Chemical Geology describing the sequential extraction procedure we developed, also led by Carmen Nezat. We had intended to describe the relative importance of apatite as a calcium source in stands of different ages and species composition by comparing the composition of tree foliage to that of the major Ca sources, using trace metals and isotopes. This analysis is not as simple as we had hoped, because trees fractionate strontium and calcium, and tree species differ in the degree to which they do so. Amanda Dasch is preparing a manuscript describing this problem, and when it is completed, Joel Blum will be in a position to apply a modified approach to addressing our original question. This project has been supported by grants from the USDA Forest Service Agenda 2020 Sustainable Forest Research program, National Science Foundation and the New York State Energy Research and Development Authority. Assess how changes in soil Ca content resulting from nitrogen deposition would affect the storage of carbon in soil. A project update and draft summary report are available. As per agreement with NYSERDA, data from this study are available for subsequent study. Please request access to virtual study archives by email to forestecology@esf.edu. Plant nutrient uptake is difficult to estimate at the ecosystem scale. Several indirect methods are used to quantify stand-level nutrient uptake such as nutrient budgets and simulation models. In nutrient budgets, nutrient uptake is generally estimated by using fluxes such as litter fall, biomass accumulation, and root turnover. Simulation models, on the other hand, predict uptake utilizing measurements such as root length, soil solution concentrations, and uptake capacity. Many studies of uptake capacity in trees have been conducted using seedlings, despite the fact that seedling uptake may differ dramatically from that of mature trees. Other studies in forest ecosystems have used excised roots to estimate uptake, even though carbohydrate and water supply is halted at the time of excision. In this study we plan to measure uptake capacity of intact roots at several sites across the US in order to improve model estimates of ecosystem uptake. Results from the simulation models will also be compared with nutrient budgets. Leaf litter immobilizes N, reducing stream export, briefly, in the fall. We have conducted a 1-year study of the potential for wood chips to immobilize N following forest harvest, to reduce the peak nitrate delivery to streams. This work is in the context of the New York City Watersheds in the Catskill Mountains of New York. To date, Forestry BMPs (Best Management Practices) have addressed sedimentation of streams, but not stream chemistry. This work could result in the development of a new BMP. 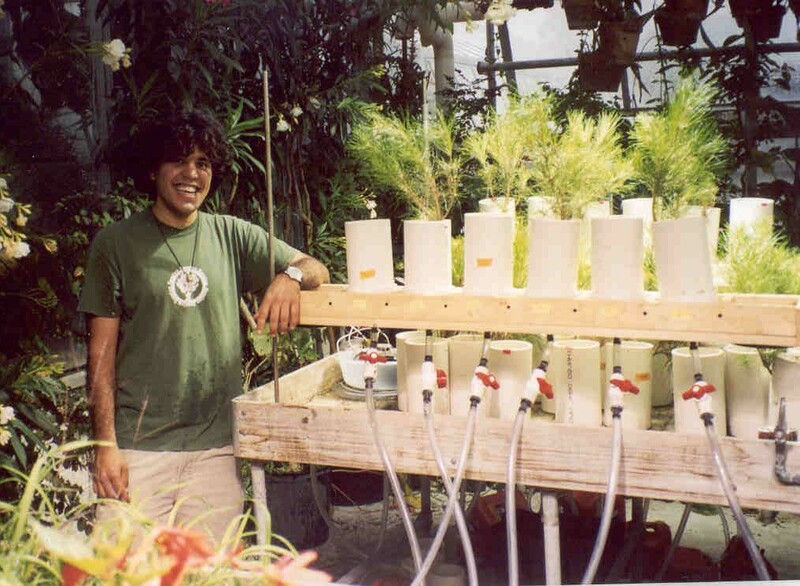 We use a steady-state model of nutrient uptake (Nye and Tinker 1977, Yanai 1994), because it allows parameters such as root length, root diameter, root length density (root length per unit soil volume), average soil solution concentration, buffer capacity, and the effective diffusion coefficient to vary over time. In natural ecosystems, root length increases and decreases seasonally, and nutrient concentrations in solution reflect processes such as mineralization, immobilization, and weathering in addition to nutrient uptake. We supply the model with values of root length, rooting density, soil solution and solid phase concentrations, transpiration rates, and soil moisture content at whatever time resolution data and depth resolution are available for each of our 6 sites (link to map of sites). A multi-dimensional sensitivity analysis shows that the most important parameters in simulating nutrient uptake are the root length, soil solution concentration, and uptake kinetics (Williams and Yanai 1996). Uncertainty analysis will be conducted for each site by running the model repeatedly using the observed distribution of parameter values (Gardner et al. 1983). We will also test the value of time-varying input by simulating uptake using annual average values and comparing them to simulations at finer resolution. YASE is a model that simulates the chemical composition of soil solutions as determined by chemical equilibria, organic matter transformations, and mineral weathering. Different properties can be assigned to different soil layers in the model. Uptake of solutes from the soil by plants, addition of organic matter, movement of soil solution between soil layers, and influx of solution from above or below the soil can be provided as inputs to YASE, either by the TREGRO model or by the user. YASE can be run alone at any time step; when called by TREGRO it is called on a daily time step. Chemical equilibria in YASE are based on the Chemical Equilibria in Soils and Solutions model, CHESS (Santore 1991). CHESS uses a matrix representation of solution chemistry (Morel, 1983). Equilibrium problems of any composition and complexity (or simplicity) can be simulated using this model, because the chemical components and the rules for combining them into species are supplied by the user. Decomposition in YASE follows the algorithm of GEM (Rastetter et al., 1991): transformations among extractives, cellulose, lignin, and humus are affected by temperature, soil moisture, N availability, and a ligno-cellulose index. Weathering in YASE is defined by the user using mineral compositions, weathering rates, and reaction orders with respect to pH and the amount of mineral present. Cation exchange is treated as an equilibrium between adsorbed and dissolved species interrelated by selectivity coefficients. YASE was developed to be compatible with TREGRO. To be used in combination with TREGRO, YASE must be parameterized to include the nutrients of possible importance to the plant. A HyperCard interface aids in the parameterization and running of the model, whether alone or in combination with TREGRO. Most estimates of nutrient uptake are obtained using excised roots or roots recently excavated from soil. Using this sand-culture method, we are able to obtain estimates of nitrate and ammonium uptake of seedlings. 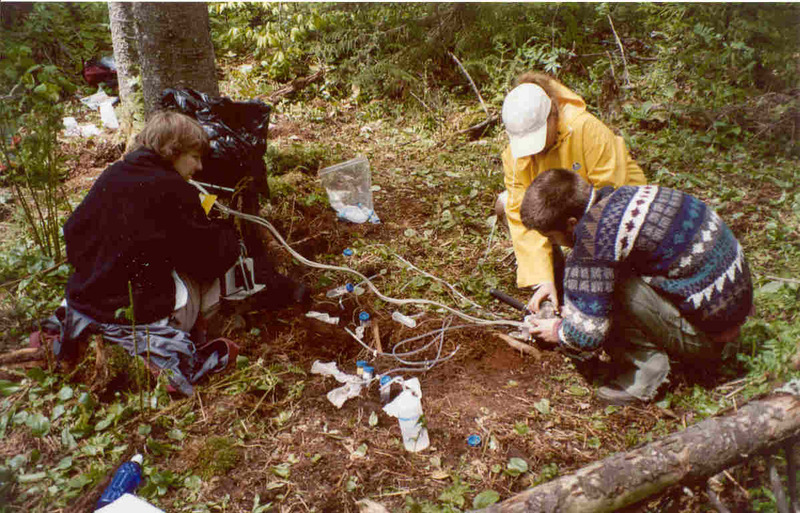 We installed these SUM (soil uptake monitoring) columns in the field and plan to test this method using mature sugar maple and eastern hemlock in spring, 2004. Copyright © 2018 SUNY College of Environmental Science and Forestry. All Rights Reserved.